In the past decade of working with college students, one of the most common resources I’ve scoured the internet trying to find is a simple guide for white students desiring to better understand their ethnic identity and their role in the work of justice. There are lots of great resources out there but many are either too dated to be relevant to the Trump era or too academic to be immediately actionable. I’m happy to report that I have finally found a book to buy in bulk for intrepid students and friends for the next decade. Pastor Daniel Hill’s book, White Awake: An Honest Look at What It Means to Be White (IVP), engages academia while remaining approachable, acknowledges deeper spiritual realities while remaining practical, and roots itself in the Gospel and in Scripture while pressing us beyond the walls of the church building. It is the whole package given to us in under 200 pages – exactly what I am looking for. Following a few introductory chapters to lay some necessary groundwork, Hill’s book is structured around seven clearly defined stages of white identity. You might think of them as signposts along the way, letting you know the lay of the land at each stage and giving the necessary guidance to make it through the next leg of the journey. At each stop, he engages with Scripture, relevant social science theory, and compelling personal narratives to guide the reader into understanding. The book wraps with well-written discussion questions that make me itch to get a group of friends together to discuss it. Beyond the personal challenge that this book was for me (the chapter on Self-Righteousness is heavily underlined in my copy – ouch), one of my favorite things about this book is its pacing. That may sound strange but Hill manages to avoid several tropes of the “popular ministry handbook” genre that left me feeling pleasantly surprised at the end of each chapter by its clarity and sharpness. Here is one brief example to illustrate my point: it’s common in books like these to introduce a theoretical framework or ministry model (“Seven Stages of White Identity”) and then brazenly attempt to overlay that concept onto a biblical narrative, suggesting that there is a character or story in the Bible that perfectly embodies the journey you desire your readers to take. It would not have been hard to imagine Hill finding a character with cultural power (Peter in Acts 10, Moses in Exodus, Esther) and then attempting to mine these seven stages out of their story. Trust me – I have read dozens of books like this and the hermeneutical gymnastics eat up so much page space and attention capital that whatever point the authors gets easily lost in the shuffle for a critical reader. Mercifully, Hill’s book engages with Scripture responsibly and appropriately for each stage. Instead of beating up a passage of the Bible to justify his eloquent theory, Hill saves some of his most poignant writing for his unpacking of the biblical narrative. I promise you will never read the stories of Matthew and Nicodemus, among others, in the same way again. There are a number of easily transferable tools for leaders and practitioners that Hill gives throughout the book. The seven stage framework itself is a goldmine for those of us in the business of discipling white people through their identity development. However, perhaps the most impactful tool for me, personally, was the first one mentioned. The exercise was simply to list them and then take note of the cultural backgrounds they represented. I believe this exercise would be provocative and convicting enough for 90% of white folks to decide they need to take greater ownership over their journey toward awakening and active participation in God’s shalom in the world. I legitimately believe every white Christian should own, read, and discuss this book in 2018. In fact, for any of my local friends who are reading this, I will put my money where my mouth is. If you promise to read this book in 2018, I will buy and deliver a copy for the first five people to comment either here or on my Instagram feed. I hope this leads to some great conversations and real change for all of us. Every year I set a goal related to reading. This year, my goal was to read for thirty minutes every day. It went…okay. I think if you averaged out the time across the year, I probably got to or near the finish line. Let’s say B+ for effort. For 2018, my goal is to only allow myself to start a new book once I’ve journaled or blogged about the book just finished and can point to one practical step I’m taking in my life as a response to what I read. I am learning as I get older that I often love to finish a book just for the sake of finishing and moving on to the next one. My hope is that this habit will push what I’m reading toward actual growth in my life. I started off 2017 with a good sense that I was about to leave the missionary agency I had been with for nine years. One of the goals my wife and I had in that transition was to get a better sense of what our family’s mission is in the world. We are certainly still trying to understand that but I can tell that themes like vocation and calling were central for me in 2017. I first heard the term “racial reconciliation” in college and, as the author herself laments, the hardest thing about reconciliation is not explaining it; it is practicing it. How do you actually work toward reconciliation as a community? This is the closest thing to a handbook on reconciliation that I have read and I would heartily recommend it to you if you are looking for a community resource. You can read my full review here. This book would also win my 2017 Award for Most Boring Cover. I have owned Visions of Vocation for at least a few years and never thought to open it until I read about Garber in Jena Nardella’s book, One Thousand Wells. Garber is the principal of the Washington Institute for Faith, Vocation, and Culture and is a consummate mentor even across the medium of a book. If you want to learn more about vocation in 2018, check this one out. I have already decided to buy every book Andy Crouch writes so this wasn’t a shocker for me. However, if you’ve found yourself daunted by his 10,000 foot thinking before, I would recommend giving this book a chance. It is an immensely practical treatment of the role of technology in our lives. I genuinely believe every new parent should be issued this book as they leave the hospital. You can read my full review here. I heard about Smith, a philosophy professor at Calvin College, from listening to podcasts featuring Sandra McCracken and Andrew Peterson. When two of my favorite songwriters recommend a book, it goes on my Amazon Wish List. Smith argues prophetically that humans are not primarily thinking creatures in need of better worldviews; we are instead, desiring creatures in need of better liturgies to shape our hearts. Timely and beautifully written – don’t miss it. As someone engaged in “mission work,” for the past decade, I have read roughly one billion books on being missional. There is an entire industry that exists to convince you that your church or ministry is wildly old-fashioned and irrelevant and, if you only buy a certain book and attend the $500 annual conferences designed around it, you too can be missional and actually love Jesus. If I could recommend one mission-centric book that you could buy today and then unsubscribe from all of that silliness, this is it. Having worked with college students for my entire adult life, I know that it is usually around this age that many develop a heart for justice in the world based on their exposure to perspectives beyond their home experience. If you are opening your eyes to injustice in the world and looking for a great first book to accompany your journey toward active engagement, I found Embrace to be a wonderful, simple introduction into the Christian movements for justice. Hot take: This may be the most prophetic and necessary book on leadership for our generation and it was written twenty years ago. Friedman’s key point is that organizational leadership in our time is crippled by interpersonal relational anxiety and using all of the wrong tools to address the problem. It is dense and challenging and bypasses many of the “ten simple steps” and other bland tropes of the genre. I’m still chewing on it months later. Drawing inspiration from the Slow Food movement, this book is structured around the themes of Ecology, Economics, and Ethics. It pushes back against the “mcdonaldization” of the church, particularly in the urban core of cities in which so many white millennials, in particular, find themselves living and attending church. If you, like me, find yourself in that demographic, I would highly recommend this book. Our family devoured this book in 2017. When we could have been watching TV or going to bed, my wife would instead choose to read Steinbeck. I had to see what all the fuss was about and I was not disappointed. Between the highly readable prose, the cavernous depth of characters developed, and the fascinating biblical narrative parallels and theological conversations, I got hooked on it too. Timshel! The Book of the Dun Cow by Walter Wangerin, Jr. This was another book highly recommended by a handful of songwriters that I admire and I am glad I finally crossed it off my list. It’s a little bit Orwell, a little bit Chaucer, and a little bit The Hobbit – all wrapped around an epic good versus evil story where even the good characters have to come to terms with the evils within. It’s an easy read with a beautifully sad and heroic ending that is wonderfully satisfying. How about you? What did you read and love in 2017? What were some major themes from that reading for you? Any recommendations for my 2018 list? 5Q: Reactivating the Original Intelligence and Capacity of the Body of Christ by Alan Hirsch. 100M (April 2017, 216 pp). Confession: I am an Alan Hirsch fan. This is the second of his books that I’ve reviewed and the fourth that I’ve read, following in the footsteps of The Forgotten Ways, The Permanent Revolution (with Tim Catchim), and Untamed (with Debra Hirsch). I have also had the pleasure of hearing him speak at a few different conferences and I find him to be an enjoyable and stimulating speaker and thinker. He is undoubtedly brilliant and has spent years studying social and spiritual movements to unearth wisdom and insight for the Church today. Probably his most significant contribution to the missional conversation for the past 10-15 years has been to recenter the Fivefold giftings (Apostle, Prophet, Evangelist, Shepherd, Teacher – collectively known as APEST) found in Ephesians 4 and give church leaders handholds for incorporating these giftings into the practices and organizational systems of their churches. 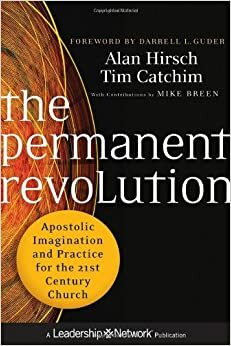 If you have heard the term “apostolic” thrown around by a pastor or church leader in your circle, I would wager that they have been influenced by Hirsch or someone from his various tribes (Forge, 100 Movements, etc.). His books have offered me great personal encouragement and rebuke as I wrestle with some of my own hangups as a church member and ministry leader and I have used his tools and insights to train others as well. That being said, my primary critique with any Alan Hirsch book is that they are normally 25-30% longer than they need to be. Alan is a framework thinker and paradigm shifter and he seems to find it irresistible to make sure the reader sees as many threads of connectivity as possible between his new paradigm and the worlds of sociology, art, history, and, in this book, even in the patterns of creation itself. The first sixty pages of this book are pretty tedious both in the retreading of other material from his previous books (some of which, admittedly, is probably helpful to a new Hirsch reader) and in the amount of time spent at the 10,000 foot view without ever getting to even a single anecdote or practical application. I can very easily imagine a 150 page version of this book that would be equally if not more effective. As a practical example (so as not to be hypocritical), I am a heavy outliner when I read but I outlined only one memorable concept for the first 77 pages of this book and it was a block quote from another book. A stronger editing hand notwithstanding, the core theme of this book is a sharp and necessary challenge to the Church in our time. With 5Q, Hirsch is making the central argument that the fivefold giftings are essentially archetypes that have been hardwired into creation and fully embodied in the life, ministry, and teachings of Jesus. Given then that the Church is to be the embodiment of Christ (“the fullness of him who fills everything in every way” – from Ephesians 1), any local church should be marked by the full manifestation of these five callings. It may sound simple but this “If A, then B and if B, then C” style of argument is actually pretty revolutionary, particularly in Western evangelical culture which is constantly wringing its hands over what the “marks” of a true church should be, particularly over and against parachurch models and fear regarding theological/doctrinal error. Into this conversation, which sadly often devolves into power-grabbing and scarcity outlooks on ministry, Hirsch injects a much-needed and well-developed paradigm shift. I say “shift,” but like all great missional “innovations,” its biggest strength is in its ability to “shift” us back to our centerpoint of the life of Jesus as revealed in the Scriptures. Hirsch is essentially saying that you can identify a “church” by the degree to which any community embodies the five central functions of Jesus’ own ministry. Like IQ or EQ which seek to describe an individual’s intellectual or emotional capacities, Hirsch imagines 5Q as a paradigm by which to measure and describe a given church’s capacity to image and embody Christ’s continued ministry in the world. If this material were to be taken up, studied, and applied by a local community, I can certainly imagine some dramatic and helpful changes occurring that would likely lead to at least a broader recognition of giftedness in the community and a balancing away from certain gifts that tend to be more celebrated, like Teaching. Though there are a few helpful assessment prompts and visuals, the book stops just short of practical while pointing the reader to a workbook that can also be purchased separately for those wishing to implement the material (a common theme with Hirsch’s books) and a website that has a few free resources, options to pursue deeper consulting and paid assessment tools, and promises of more to come. For my own personal benefit, I would have loved even a handful of brief anecdotes of churches and organizations that have used 5Q successfully but they were sadly absent from this book. Again, I want to reiterate that this book is primarily the communication of a paradigm by which to conceptualize the Church. There are very few stories and even fewer tools, per se, given that could be immediately used in a practical sense. That being said, there is a helpful diagnostic exercise (p. 140) that Hirsch encourages the reader to use to “score” their community’s 5Q from 0-5 in each of the five functions. The scoring is done on a concentric pentagon (see image) with each point representing one of five such that you’re left with a visual representation of your community’s 5Q. Combined with a robust communal understanding of the five gifts, I think this diagnostic could be a powerful tool for assessment and strategic planning for leaders to use as they consider their community’s strengths and shore up its weaknesses. This is a book for leaders who enjoy conceptual/framework thinking, don’t need a lot of practical handholds in order to implement what they read, and are looking for a fresh take on injecting APEST-style leadership into their community wholesale. If you’re new to Hirsch/APEST, I would actually recommend starting with The Forgotten Ways, which for me is his most practical work, and then decide if you want to keep going from there. The middle ⅓ of this book is wonderful and a great jumping off point from TFW but the first and last ⅓ are pretty tough if you don’t enjoy Hirsch’s communication style. This is the third of Dr. Brenda Salter-McNeil’s books that I have read, including The Heart of Racial Justice and A Credible Witness. These works generally specialize in motivating followers of Jesus to pursue racial reconciliation, motivated by her beautiful retelling of familiar Gospel narratives (e.g. The Woman at the Well from John 4 in A Credible Witness) and clarion call to recognize the deeper spiritual realities at work in the social and racial inequities we see in our world (The Heart of Racial Justice). Her storytelling is excellent and often deeply personal, admitting her own failures along the way and making space for reconciliation novices and experts alike to engage fully in the text. My only critique of her writing is the one that apparently became the impetus for this new book. Namely, what is the actual process communities should undertake if they wish to become reconciled? I have found it hard to practically apply much of what I’ve read from her beyond my own individual life. Thankfully, this critique has been soundly answered with this book. The long and short of it is that this is the most accessible and practical book on reconciliation that I have ever read. Dr. Salter-McNeil’s roadmap (see image) is an indispensable resource for churches and other organizations who are wondering where to begin after the catalytic events (to borrow her language) we see happening on the news seemingly every week involving racial injustice in our country and abroad. One of my favorite elements of the book is that she takes great pains to give the reader access to brief bits of the academic research that went into her model, summarizing complex sociological theories and seamlessly weaving them into the popular level insight she means to impart. You can certainly check the endnotes for further personal research and this section of the book alone is worth the price of admission. On a practical level, this book is written to be immediately applied in a leadership team or small group setting; almost everything can be transferred. In my own life and ministry, I found the rules she gives for facilitating dialogue between different groups (racial groups, congregations, political sides, etc.) to be incredibly practical and I will almost certainly use them at the next opportunity. Near the end of the book, she also passes along “Eight Habits of Interculturally Competent Leaders, providing a quick self-assessment that I can also imagine using in a staff meeting quite easily. I think every Christian leader responsible for interpreting Scripture alongside the events happening in our world should own and reference this book. I think it would be an incredible resource to go through with a leadership or staff team that is serious about making serious and significant organizational change to pursue reconciliation and justice together. If you’re looking for a book with more personal application, I would try one of her other books listed above. One of my goals for 2015 was to read a book every week. I blew it. Before I get into telling you which books I loved (and loved less or, frankly, disliked) from 2015, let me start with that confession. I had every intention of reading one book, every week, and then blogging a review of that book to help me process and integrate what I read into my life. It didn’t happen. How badly did I miss the mark, you might be wondering? Pretty badly. I read 31 books this year (that I remember) – 25 non-fiction and 6 fiction. That works out to just a little over one book every two weeks. Not exactly setting any records but still somewhat of an impressive list when you type them all out single-space in Microsoft Word. With no further ado, let me tell you what I thought was great in 2015, bearing in mind that this simply means books that I happened to read within the calendar year 2015, not necessarily books that came out in 2015. As C.S. Lewis taught me, old books are to be valued at least as highly, if not more so, than new, and so I tried to read some of both this year. Bear in mind as well that top five lists on the internet are so arbitrary and subjective that you might just as well ask a stranger on the street than take my opinions as helpful but, if you’re feeling especially curious, read on. This book wrecked me in the best possible ways. One of the things I have most appreciated about my time with InterVarsity is the heavy value that has been instilled within me for fighting to understand the world from ethnic and cultural perspectives outside my own. This brief-yet-brilliant little book helps the reader understand some of the critical themes that underscore a Latin@ hermeneutic of Scripture and the Christian experience. As a white man living in Saint Louis in 2015, this book challenged my reading of Scripture from a position of privilege and power and caused me to look again at stories that I thought I knew, calling my attention to a God who aligns himself with the marginalized and beckons for the privileged to join him not in the centers of power but along the frontera, that place at the edge of our understanding and along the borders between two peoples where mutual growth and flourishing, instead of alienation and conquest, can thrive. Much ink has been spilled over this book’s brilliance and necessity “for such a time as this.” Dr. Cornel West called it “the secular bible of a new social movement” and that makes complete sense to me. This book challenged what I thought I understood about the depths of brokenness of the system of mass incarceration (hint: no matter how broken you thought our justice system was, it’s worse). However, the most startling parts of the book for me were Alexander’s brilliant retracing of the historical connections that link Mass Incarceration back to Jim Crow and back still to Slavery. As the saying goes, those who forget the past are doomed to repeat it. As I see Donald Trump continuing to rise in popularity, Alexander’s book haunts me and I pray that it will not be any more prophetic than it already has been. This book is a must-read, particularly for evangelicals trying to make sense of the #blacklivesmatter movement and other burgeoning populist social movements and their place in our nation’s history. My only practical ministry book that made the best of cut. To be honest, I find a lot of “how-to” ministry books to be incredibly boring. Normally, the author has a handful of paradigms they are desiring to transfer into your skill set but, instead of creating a five-page PDF, they write a 200 page book, mostly filled with haphazard exegesis about how their acronym on discipleship was, can you believe it, what Jesus was doing all along! So simple – how did we miss that!? This book, on the other hand, was the most practical evangelism book I have ever read. Crosetto, an IV staff in California, covers every issue I can imagine to address our natural fearful bent away from sharing our faith. From Spiritual Warfare to Asking Good Questions to Sharing Stories to Learning to Discern the Holy Spirit’s Voice, there are steps and tips all over the place, yet you never feel overwhelmed. The book has a natural progression that I think would be brilliant to go through with a group of leaders of any age desiring to grow in their ability to share the Gospel. The stories are useful as examples and the Scripture used is helpful without feeling like unnecessary page-filler. There’s even some additional videos and group resources that were created to aid in learning transfer. Overall, a great book. I actually don’t want to say much about this book because you just need to go buy it right now and read it. Berry is most famous for a series of books about a fictional rural farming town in Kentucky transitioning in the early-to-mid twentieth century away from previous generations who have valued community and longevity above all else to the rising generation escaping via newly formed highways and readily accessible automobiles to cities far from home. I have never ached for home or community more than when I read this book (and Hannah Coulter before it). Go buy it and then force your best friends to all move on to your block with you – that’s my plan from here. Whew. We made it. Those were the five best books I read in 2015. If you’re curious and haven’t fallen asleep at your computer yet, I’ll include the full list from 2015 – feel free to comment below if you want recommendations from the further list. *Note: Andrew Peterson’s The Warden and the Wolf King, the fourth book in his Wingfeather Saga, came out in 2014, but I made myself re-read the previous three to recapture the story before finally finishing it this past year. It was beautiful and moving and a perfect ending to the saga. If you have kids, go buy those books. If you don’t have kids, admit that you still love kids’ books and go buy them anyway – you will not regret it. 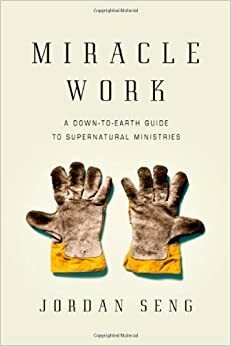 The Overview: The subtitle on the cover of Miracle Work reads, “A Down-to-Earth Guide to Supernatural Ministries.” This is a perfect description of what this book is all about. Jordan Seng, the pastor of Bluewater Mission in Honolulu, HI, contends that followers of Jesus should live and minister in two distinct ways: (1) with an everyday awareness and practice of the supernatural power of God at our disposal and (2) in humble proximity to those who most need the miraculous work of God in their lives. The chapters in his book, after a few introductory pages, alternate between descriptions of five supernatural ministries (healing, deliverance, prophecy, intercession, and the Baptism of the Holy Spirit) and personal anecdotes of those gifts at work. He labors to give an explanation of both what supernatural ministries are and what it feels like to use and grow in them. The Good: This book is immensely practical and relatable. For someone coming from a conservative evangelical background with minimal exposure to supernatural ministry (or charismatic gifts or practice as it is sometimes called), I came in open-minded but wary of potential red flags that I have often associated with ministries particularly focused on these practices. Honestly, other than some likely theological disagreement with the chapter on the Baptism of the Holy Spirit, I didn’t see much with which my fellow conservative evangelical friends would disagree. This is simply a primer on what these five miraculous ministries are and practical steps in learning and using them. Dr. Seng is charming and personable as he explains simple tips and shares stories from his own experiences, including his failures as well as successes. He is sharp and succinct on the “how-tos” and thorough and pastoral in his explanation of the “what-ifs” (“What if this doesn’t work the first time? What if I use the wrong words? What if things get really intense?”). The interesting thing about supernatural ministry, in my experience, is that though the listing of these gifts is seemingly always associated with gifts that are used all the time in our church and parachurch ministries (teaching, knowledge, wisdom, serving, evangelizing, etc. ), they are almost never talked about, let alone used, in many Christian circles. I have given hours of my life to being trained as an evangelist; I have never even heard of a training on healing or deliverance. In this book, Dr. Seng balances this equation and gives us some practical tools that we need to be fully equipped for ministry as those who walk by the Spirit. The Bad: This is a book that you will either love or ignore, period. I wish that Dr. Seng had included a chapter near the beginning that addressed the walls of resistance that many will no doubt have about retooling their ministries or worship services to allow for the utilization of these supernatural ministries. A five-page chapter entitled “For all my Reformed and Catholic readers…” with some sharp theological critique of the neglect of these gifts and caring pastoral guidance over the stereotypical barriers that exist between certain camps of Christians would have done wonders to help this book appeal to a broader audience. It is somehow both a relaxing charm and a minor disappointment that Dr. Seng moves quickly out of the station without slowing down to see if he lost anybody who wasn’t already on the bus. Using Scripture and experience to back up the argument, Dr. Seng argues that our growth in these four areas will lead to greater access to successful uses of the Holy Spirit’s power. Admittedly, I was a bit skeptical of something so spiritual laid out in an equation but the more I read his explanation, the more I found myself resonating with his logic. If we grow in our obedience to Jesus, our understanding of and appreciation for the gifts, our willingness to risk and say yes to Jesus, and our willingness to sacrifice our worldly desires for holy living, doesn’t it make sense that we would become more attuned to the voice of Jesus and be able to discern his will and access the resources of the Holy Spirit? It certainly does to me. Who Should Read This: This is a book that should be read by ministry leaders and practitioners who are genuinely desiring to grow in their understanding and practice of the gifts of the Spirit. This is not a book for those who desire a theological explanation for why these gifts are still usable and useful today (other than the chapter on the Baptism of the Holy Spirit, which is quite challenging and theologically well-argued). One of my goals for 2015 is to finish one book every week. I love reading and usually have a few books going at a time but I notice that though I may finish several books in a year, I don’t always retain much of what I’ve read. To combat this trend, I want to start reviewing and synthesizing some of that here, likely just for my own personal enjoyment. Here we go! The Overview: In Ephesians 4, Paul offers what many have argued to be the key lever for understanding missional leadership in the Church: the fivefold gifts of Apostle, Prophet, Evangelist, Shepherd, Teacher (APEST for short). Hirsch and Catchim weave together biblical studies, theology, organizational theory, leadership theory, and elements of other social sciences to argue for the return to this model of leadership, particularly for the re-centering of the apostolic function in our understanding and praxis of missional leadership in the Church. They trace a historical de-centering of the apostolic (along with the prophetic and evangelistic) and an unhealthy bias and obsession focused on those with shepherding and teaching gifts. They spend about 1/3 of the book establishing Ephesians 4 and the APEST roles as a framework and the rest of the book unpacking the function of the apostolic specifically. The Good: This book is brilliant at its best moments and smarter than most at its worst. The authors offer a solid and well-reasoned argument for the prominence of the Ephesians 4 text in our understanding of leadership in the Church and an equally strong critique of its marginalization. Alan Hirsch is at his best when he is trumpeting the priesthood of all believers and his “everybody gets to play” understanding of mission in the local church context and this book is no exception. The first third of the book presents a robust understanding of how the five functions fit together and the capacity for Kingdom-building that could be unlocked were they properly understood and empowered. Without doubt, the authors paint a compelling picture of the Church fully activated in the world. Throughout the other two-thirds, they employ (unforgettably, at times) the best of current thinking in entrepreneurial practice and sociological understanding to illuminate the truths of Scripture and apply it liberally to much-needed areas of church leadership, particularly focusing in on culture change, leadership development and deployment, and missional innovation. This is a small detail but I also highly enjoyed the quotes from various world leaders, Christian and otherwise, that began and cast light onto the chapter to come. The Bad: While intelligent and well-researched the book certainly is, easily accessible it most certainly is not. The first third is well worth the price of admission and easy enough to understand and apply. The back two-thirds, however, take a fairly disciplined reader with a heavy interest in social psychology, entrepreneurial leadership, or both, to endure to the end. The book is tedious at times with diagrams, analogies, and expansions of material already covered. Hirsch and Catchim seem almost overly eager to show the reader how many connections to sociology and business practice can be made in the realm of the apostolic. No doubt a heavier editorial hand would have been welcomed by many a reader (or would-be-reader). Also, my wife hates the cover, so -2 points. The Transferable: Much of the first hundred pages would be easily transferable in the realm of the average ministry leader. Hirsch and Catchim’s definition and explanation of each of the fivefold gifts are brilliant in their scope and application. I recently taught a group of young potentially-gifted evangelists the Evangelistic Ministry Matrix (pictured at left), which helps explain four different types of evangelistic function. This was an eye-opener to some who had previously questioned their evangelistic gifting based on stereotypes with which they could not relate. Who Should Read This: I would argue that a basic “reader’s digest” version of the book’s best material can be found in other works by Hirsch (and his tribe). However, I have yet to come upon a more thoroughly unpacked rendering of the five gifts and their functions in the Church. For that reason, I would highly recommend the first third of this book for any leader with a level or two of leadership beneath her who desires to see everyone activated in mission. I would also recommend parts of it to any follower of Jesus who seeks to understand the APEST gifts and their rootedness in Scripture. I would recommend the back two-thirds to apostolic leaders (planters, entrepreneurs, movement thinkers) who geek out on Seth Godin, Malcolm Gladwell, and the like, and who love making connections between the worlds of church leadership and the social sciences. The Overview: Ruth Haley Barton writes a lot about spiritual formation and spiritual disciplines. This is a book about pursuing Christ-centered transformation in communal settings that leads to deepened relationships with both God and others. Core to the book is the idea that our communities need to be practicing communal spiritual disciplines and intentionally creating space for Jesus to speak and move in our gatherings. The Good: Honestly, there is a lot to praise about this book. It is structured around Jesus’ interaction with the disciples on the road to Emmaus in Luke 24. Barton’s writing is that rare combination of deep rootedness in Scripture, practical application, and pastoral guidance of the reader through the material. The reflection questions peppered throughout each chapter are actually helpful and the next steps designed for groups at the end of each chapter feel like something I would actually want to do with some friends. For ministry leaders, there are many group spiritual discipline tools that she presents throughout that are easy to adapt and borrow for use with your people – in fact I just used one recently with some of my InterVarsity leaders. To summarize, the book is an incredibly useful guide in moving community groups from a loose confederation of people who attend the same corporate gathering to a family of people committed to walking together as they are being changed by Jesus. The Bad: There is not much that I have to offer in critique of this book but one small notes does seem important. In Chapter 5, Barton takes on the issue of gender in community. Much of what she has to say is beautiful and incredibly helpful, particularly while much of Western evangelicalism seems bent on reading our own specific cultural marriage and gender norms into Scripture. Barton maintains that men and women were created for equality and partnership in relationships and that the best communities will affirm and recognize the gifts that both bring to the table. I think this is refreshing and helpful. However, she seems to push the pendulum a bit too far back (in my opinion) as she openly criticizes the perceived need for gender-specific community and vaguely seems to advocate for completely unguarded vulnerability between men and women in community settings. While I don’t think that gender-specific community is best for someone all the time, it has been my (albeit, limited) experience that there are specific issues that are handled best in gendered sub-communities, particularly as relates to sexual brokenness. Paul seems to advocate for at least some functional need for gendered community in Titus 2 and I would guess that most followers of Jesus have benefited from such sub-groups in various seasons. That being said, there was much to glean from this chapter as well. The Transferable: Each chapter contains a tool or two that would be easy to replicate and teach to people that you are discipling. 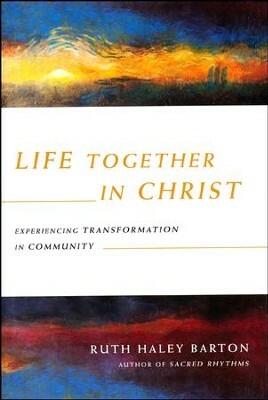 My favorite was from Chapter 3, which focuses on intercession in community. Here Barton gives a helpful framework and a very simple tool for teaching listening prayer as a means of helping people within a group hear a word from the Lord for themselves and others. I just used this with my leaders recently and several of them reported hearing encouraging and refreshing words from Jesus with its use. Who Should Read This: This is a great book for all but I would highly recommend it for anyone who leads a group of people on a regular basis and is desiring deeper community and a deeper realization of how Jesus can transform you as you gather. As someone who has led several communities over the past 10 years, it was a breath of fresh air and a helpful reminder that Jesus is the one who brings change to our communities.